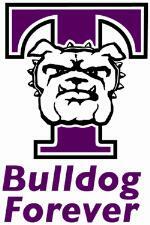 Truman is the newest member of the Great Lakes Valley Conference (GLVC) after the league’s Council of Presidents voted unanimously June 7 to accept the Bulldogs into the conference. The Bulldogs will begin play in the GLVC in all sports beginning in the fall of 2013, competing as the league’s 16th member. “The GLVC Council of Presidents unanimously endorsed Truman State University’s application for membership because of their tremendous portfolio in both academics and athletics, which has been enhanced in recent years by the outstanding leadership of University President Troy Paino,” said Dr. Thomas George, chancellor at the University of Missouri-St. Louis and chair of the GLVC Council of Presidents. Truman will be the seventh Missouri school to join the GLVC since 1995 and the sixth to do so in the past eight years. Truman will be joining three other GLVC schools who are among 24 institutions nationally that have more than a 90 percent academic success rate. “This is an exciting time for the University and this move will not only help us establish and renew rivalries with fellow GLVC schools, but it will also bring the Bulldogs to areas in which we recruit students and have high concentrations of alumni,” said Jerry Wollmering, director of Athletics. The GLVC was established in 1978 and is currently one of the largest NCAA Division II conferences in the country, featuring 16 schools and 18 sports, including the addition of football this fall. The conference was established primarily in Ohio, Indiana and Kentucky but has moved westward to include four Illinois schools, six Missouri schools and one school from Wisconsin among its membership. The current members of the GLVC are: Bellarmine University (Louisville, Ky.), Drury University (Springfield, Mo. ), Kentucky Wesleyan College (Owensboro, Ky.), Lewis University (Romeoville, Ill.), Maryville University (St. Louis, Mo. ), McKendree University (Lebanon, Ill.), Missouri University of Science & Technology (Rolla, Mo. ), Quincy University (Quincy, Ill.), Rockhurst University (Kansas City, Mo. ), Saint Joseph’s College (Rensselaer, Ind. ), University of Illinois Springfield (Springfield, Ill.), University of Indianapolis (Indianapolis, Ind. ), University of Missouri-St. Louis (St. Louis, Mo. ), University of Southern Indiana (Evansville, Ind. ), University of Wisconsin-Parkside (Kenosha, Wis.) and William Jewell College (Liberty, Mo). The addition of Truman marks the league’s fourth expansion in the past five years. Maryville and Illinois Springfield joined the GLVC in 2008 and William Jewell became a member in 2009. With the departure of current member Kentucky Wesleyan in May 2013 (admitted to new Division II Great Midwest Athletic Conference), Truman will officially be the league’s 16th member when it begins competition in the fall of 2013. Truman currently supports 20 sports, including all seven of the GLVC ‘core’ sports (men’s and women’s soccer, men’s and women’s basketball, volleyball, baseball and softball) in addition to men’s and women’s track and field, men’s and women’s cross country, football, men’s and women’s tennis, and women’s golf. Specific details regarding scheduling, divisions and travel partners will be determined with GLVC officials during the months ahead. The Bulldogs will compete in the Mid-America Intercollegiate Athletics Association for the upcoming 2012-13 academic year. Instructors looking for resources to help acquire new skills in classroom management techniques, hone their teaching skills or discover new strategies for face-to-face, blended or fully-online classrooms can take advantage of Truman’s subscription to the Magna Online Commons. Since 1972, Magna has been a leading provider of higher education professional development resources. New seminars are added frequently to the Commons. Instructors are encouraged to check the offerings regularly to make the most of Truman’s subscription. The Learning Technologies Team would appreciate feedback regarding the Magna offerings to help determine whether to renew the subscription in the future. To create a new account, visit www.magnapubs.com/account. To manage an existing account, go to www.magnacommons.com. For instructions and the required activation code to access the subscription-based content, contact the Learning Technologies Team at ltt@truman.edu or 785.7750. Anyone interested in volunteering can call the Public Relations Office at 785.4016. Proceeds go to the Northeast Missouri Alumni Chapter Scholarship awarded annually to Truman students from Northeast Missouri. Limited golf entries will be accepted through tournament day. To guarantee space, cart and lunch, pre-register by July 10. Singles and doubles are encouraged to enter. Must be 18 or older to golf. To register, go to store.truman.edu/alumni. For more details, contact Denise Smith at 785.4174 or dlsmith@truman.edu. Check out the numerous Truman alumni events happening this summer including baseball outings, golf tournaments and other social gatherings at alumni.truman.edu. Applications for the world-competitive Rotary Peace Fellowship are now being accepted. The fellowship provides academic and practical training to prepare scholars for leadership roles in solving conflicts around the world. The 2013 Academic term deadline is July 1. Applications are available at rotary.org/rotarycenters. A Thank You Reception to recognize your help and support in making Orientation 2012 a huge success. Truman will be offering the following camps this summer. For more information check out the camps link at trumanbulldogs.com. The GP LSAT Prep Scholarship is available to students interested in applying to law school. One or more grants of $1,000 are awarded twice yearly (Jan. 30 and June 30). To apply, use the “contact us” form at getprepped.com/net to request the application packet. CableTV is offering five $1,000 scholarships. Deadline to apply is June 30. For more information, go to www.cabletv.com/scholarship. AES Engineers will continue to provide $500 scholarships to high school seniors or college students, regardless of courses being studied, who meet certain criteria. Scholarships are intended for future leaders across a wide spectrum of fields of study. Students must submit an essay in answer to one of the two questions that are posted online at aesengineers.com/scholarships.htm. Deadline for entry is Oct. 5. Currently enrolled undergraduate college students are eligible to apply for the Foreclosure.com 2012 Scholarship Program. Students may go to foreclosure.com/scholarship to find out how to be entered to win one of five scholarships by writing an essay on stimulating the U.S. housing market. Top prize is $5,000, second through fifth place will receive $1,000 each. Deadline to enter is Dec. 1. Wells Fargo is offering 40 $1,000 scholarships. Twenty will be awarded to high school students and 20 to college students through a random drawing throughout the year. Apply online at wellsfargo.com/collegesteps for chance to win. Student Affairs is looking for faculty and staff to volunteer to help students move in on Move-In Day Aug. 18. Volunteers will help unload cars and carry items to rooms. To sign up, contact the Student Affairs Office at 785.4111 or email bkral@truman.edu. ITS Services Notes is a website and email notification system dedicated to keeping campus informed about technology updates and outages. To sign up for the service, visit its.truman.edu/servicenotes/subscribe.asp. The Career Center is hosting a photo contest open to all students participating in internships, practicums, field and/or research experiences and directed teaching experiences. Contestants can submit a photo of them doing their jobs and write a 300-word description to have a chance to win $100 to Walmart. Entries are due by Aug. 17. More information and contest entry can be found at facebook.com/events/205149789588139/. The next issue of the Truman Today will be available July 9. Announcements may be submitted to tmiles@truman.edu. Justice systems students Daniel Hillen and Kristen Little have each recently been published. Hillen’s review of “Experiencing Corrections: From Practitioner to Professor,” was published in the latest edition of the International Journal of Criminal Justice Sciences. Little’s review of “Criminology: The Essentials,” has been published by the Internet Journal of Criminology. Betty McLane-Iles, professor of French, attended and represented Truman at the French Colonial History Society in New Orleans in May. Along with others, McLane-Iles provided input in response to panel discussion on pedagogy and history. In contrast to others, she spoke of the challenges of her own interdisciplinary approach to teaching literature and advanced French language in a historical context to illustrate the strong need to integrate basic historical understanding into the undergraduate non-specialist learning experience. McLane-Iles also participated and assisted in responding to a session on displacement within works of French/Francophone literature influenced by the European perspective of orientalism. Sam Spencer, a communication major, earned a Certificate of Merit from the Missouri Broadcasters Association in the 2012 MBA media contest. Spencer was awarded the second-place honor in Radio Feature Reporting. The award was presented June 2 at the annual MBA awards banquet at Lake of the Ozarks. Spencer’s audio feature, “Drag Racing and the American Way,” examined the strong tie of a local family to the national drag racing circuit. Spencer’s entry, which originated in a media writing course (COMM 251), was mentored by Mark Smith and Don Krause. Spencer competed against commercial radio news organizations statewide. Lin Zhang, assistant professor of business administration, and Debi Cartwright, professor of business administration, along with Baolong Ma of the Beijing Institute of Technology, had their paper entitled “The Impact of Online User Reviews on Cameras Sales” accepted for publication in the European Journal of Marketing. Mike Elam, Physical Plant staff, received the Mentor of the Year Award at the 2012 MIAA Awards Banquet June 7 in Kansas City, Mo. Elam was nominated by the Truman Student-Athlete Advisory Committee for the Mentor of the Year Award for his dedication, friendliness and donations to all student-athletes he encounters while working in Pershing Building. He has donated handcrafted stained glass art to many team and SAAC fundraising events. 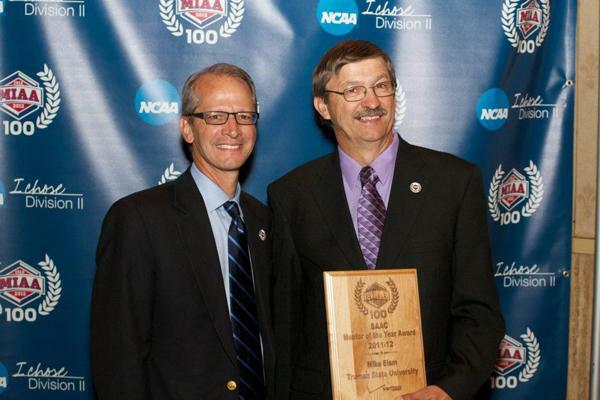 Mike Elam, right, with University President Troy Paino at the MIAA Awards Banquet. Applications for the MATH Pioneers Fellowship in Merrimack Valley, Mass., are available now at matchschool.org/matchcorps/pioneers.htm and are due June 25. Fellows will be tutoring high school algebra and geometry. 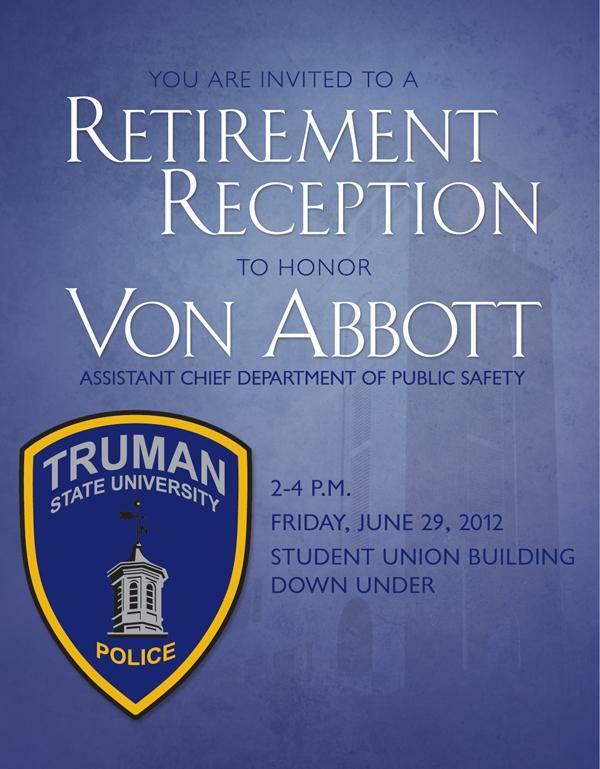 A retirement reception for Von Abbott, assistant chief for the Department of Public Safety, will take place from 2-4 p.m. June 29 in the Student Union Building Down Under. 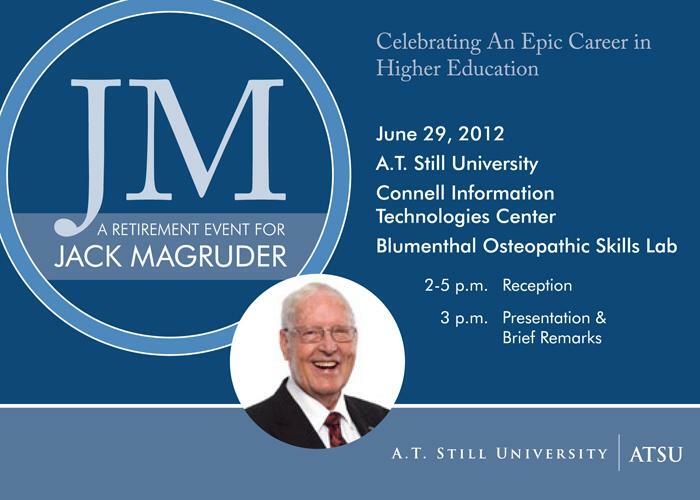 A retirement reception for Jack Magruder will take place from 2-5 p.m. June 29 at the Connell Information Center on the campus of A.T. Still University. The Strategic Planning and Assessment Workshop will take place the mornings of Aug. 15-16. The afternoon of Aug. 15 will be reserved for school and/or department meetings. Bicycling with Traffic is a 10-hour course in five classes for ages 14 and up. It is designed for both novice and experienced bicyclists. The May-June session will meet Thursdays from 6:30-8:30 p.m. at the Adair County Health Department at 1001 S. Jamison St. The course will be repeated in July-August. For more information, or to register, go online to ka-motion.org/surveys/traffic-skills-101-registration. Family Day will be Sept. 15. Organizations or departments with events planned for that weekend can email heidi@truman.edu to be included in the Family Day schedule. ATSU-KCOM will host the Fourth Annual Interdisciplinary Biomedical Research Symposium from 8:30 a.m.-3 p.m. Sept. 29. The conference will provide a venue for faculty, students and all those interested in biomedical research.